I love fruits but not banana.but when it comes to banana bread or muffin I just cant get enough of it. There is something about bananas being baked with a little cinnamon. It fills every nook and corner of our home with a delicious sweet aroma. and when that is baked on low for a longer period of time, the fruit caramelises giving it 'can't wait to grab a slice' aroma. Trust me this is no ordinary cake. This is an incredibly moist and luscious banana cake recipe, which is baked for not less than 90 minutes. Yes you read it right. This cake is baked for one and half hours, which actually caramelizes the banana and gives it a scrumptious fruity aroma and dark colour. I actually got this idea from love to cook and have been baking this for quite sometime with various ingredients. A couple of days back baked it with wholegrain cake flour, sugar free and honey for my uncle and it tasted delicious too. Just like its main ingredient the humble banana this recipe is very versatile. Eggless, sugarless or wholegrain it never ditched me. 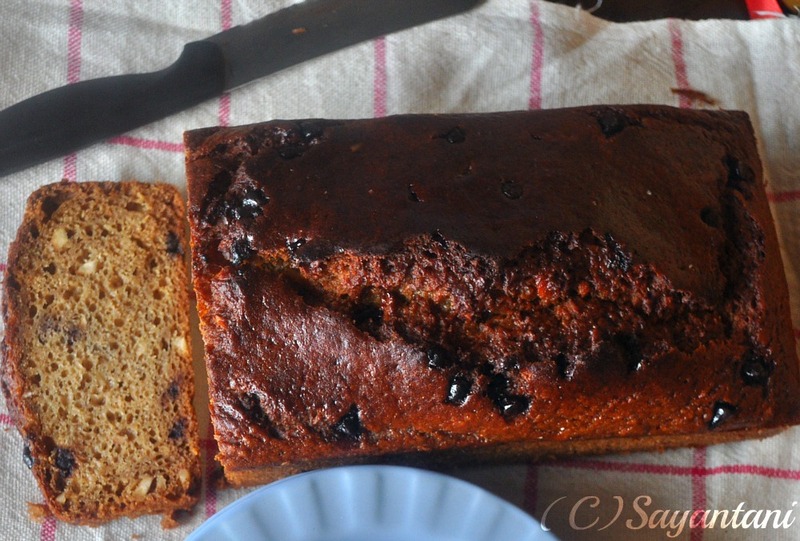 Today am sharing the basic recipe here with APF, honey and brown sugar. For other adjustment please see the NOTES below. With wholegrain flour the cake becomes a little dry so try adding 2 tbsp of milk to it. For eggless banana cake please see this recipe. The left one is with APF and brown sugar and the right one is with wholegrain flour and honey. See the difference in texture, colour and moistness. Pre heat the oven at 175C and grease one loaf pan. Mix the 2 ttbsp flax seed powder with the water and keep aside for 15 minutes. At the end of the time it will swell up and will looks like egg white. Flax seeds are called vegetarian egg as and could be used as a vegan substitution for eggs. For each egg use 1 tbsp flaxmeal with 3 tbsp water. Always soak and leave it for 10 minutes before using. Sieve the dry ingredients flour, baking soda, salt and corn flour twice. If using almond meal then mix now. Keep aside. In your food processor (mixer-grinder) jar whiz the banana with sugar or honey or a combination of both. Add the oil, yogurt, flax paste and mix again. Take out in a big bowl. Beat in the egg till the mixture looks smooth. Fold in the dry ingredients in 2-3 batches. Do not over beat. Mix in the chopped nuts and choco chips. Pour in the pan and bake for 90 minutes. If it brown too quickly then lightly cover with a piece of foil. Cool, cut and serve with whipped cream or ice cream of your choice. This is an excellent accompaniment with a cup of coffee. My son though loves it with some Nutella. you can substitute the recipe with wholewheat flour or with half whole wheat and half all purpose flour. Similarly the sugar can be substituted entirely with honey or a mix of both. but try to add 1 tbsp sugar as this will help caramelising the banana and impart a nice dark colour. Can substitute vanilla with 1/2 tsp cinnamon powder. When made with Wholegrain flour its little dry but good anyways. Use more nuts or chocolate as per your choice. Favourite cake recipes at Swathi's Zest South Indian Kitchen. Bake fest#8, this month hosted at daily cuppa. Originally started by Vardhini. Tickling Palate's Lets cook: Kids special. 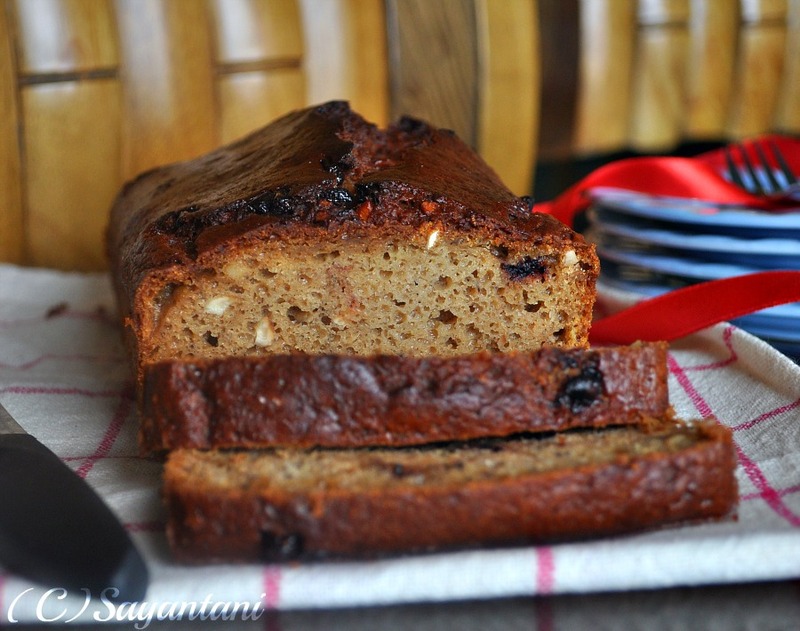 Delicious banana bread with chocochips Satayani. In my house banana bread sell very well. My hubby and princess love it. I like your son's idea of nutella on them. This banana bread looks so delicious .....I think I will have to bake it soon. Lovely. 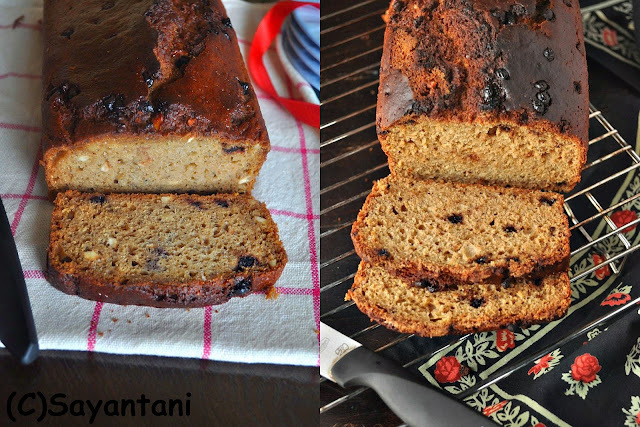 Whole wheat, sugarless is always my way but I am yet to use chocolate chips in my banana cake. Your pics look beautiful as always. I love Banana bread! looks good! The one with APF looks delicious than the healthier version! But whole wheat and honey makes the bread 100% guilt free snack! Wow love the flavor and texture,beautifully baked. delicious.. i'll try it in near future.. I don't like bananas either.. ;) Bread looks great though! Nice clicks. The bread looks super delicious. 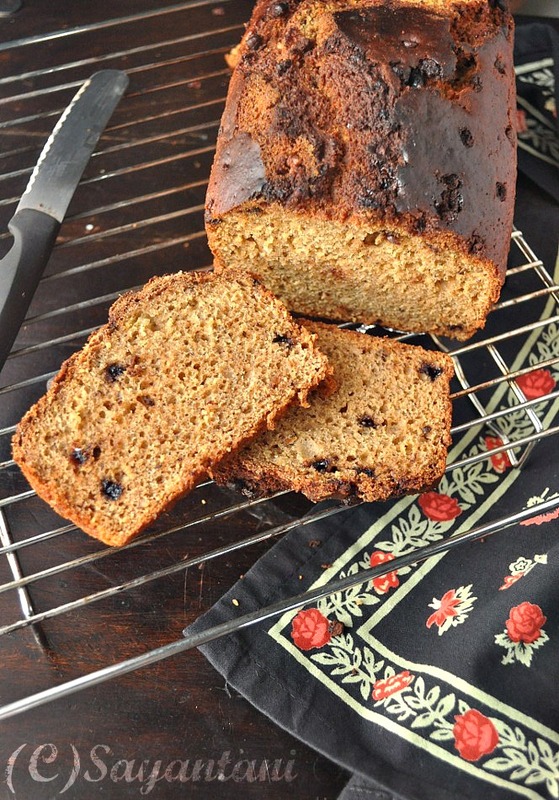 wow very healthy, yummy and perfectly baked bread! Tasty looking banan bread, amazing click. That looks lovely! banana and chocolate is an awesome combo! Banana is such a versatile fruit and gets over at home quickly. I have to hide them if I need to bread to make them over ripe. Lovely snaps and thanks for linking it to the event. 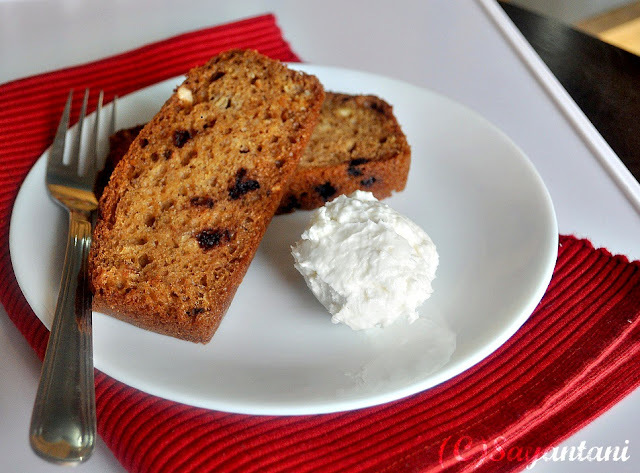 delicious banana bread.......love the recipe.....very tasty...i like both the versions! wow this is yum. Love the colour it makes me wish I had a slice or two.. It looks just amazing. The outer crust is so beautiful! This looks amazing and something I must try. Your bread came out perfectly! 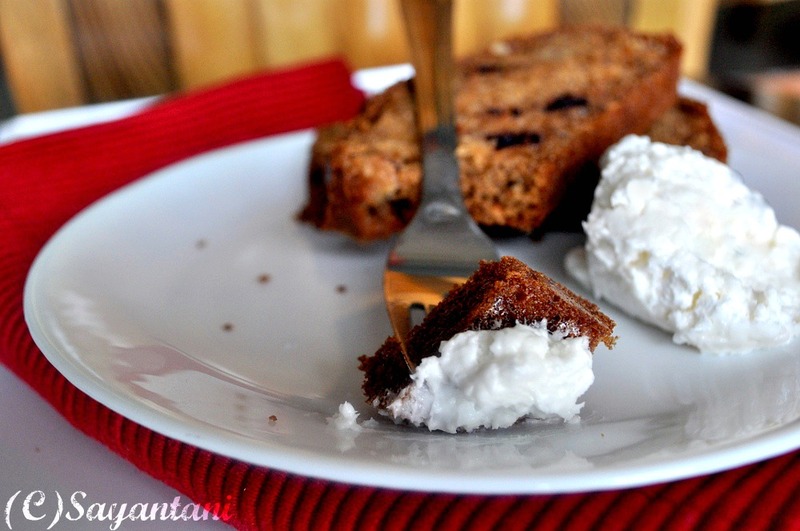 Delicious looking banana choco chip bread. Wow they came out extremely irresistible..Incredible bread. Sayantani, this recipe is a real life saver. I always have some over ripe bananas. I've been looking for a good banana bread recipe. My search ends here. Absolutely LOVE the clicks...very tempting and inspiring me to bake this bread right away. It's amazing that this is not a yeast recipe! I'm kinda jinxed with yeasted stuff, so this has been bookmarked! Thanks for sharing! 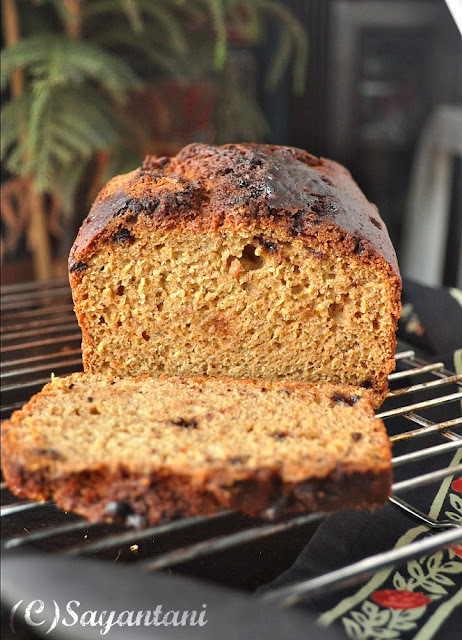 the banana bread looking delicious...and yummy...adding choco chip gives it more flavor..
Banana bread looks superb with choco chips in them...yum...Lovely capture ear..